Blumberg: "I couldn't sleep all night because things keep coming back"
Shooting highlights importance of "placing greater emphasis on prejudice, hatred"
(CNN) -- The gunman who opened fire at Washington's U.S. Holocaust Memorial Museum this week is no better than a suicide bomber, a survivor of the Holocaust said. 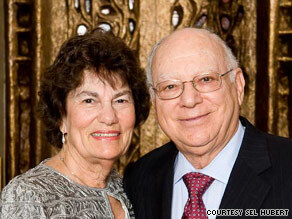 Sel Hubert, seen here with his wife, says education is the best weapon against bigotry. Sel Hubert, 83, of Rye Brook, New York, said he also fears that through the shooter's "ultimate act of Holocaust denial," he has invigorated others who embrace hate and who might wish to exact violence against others. "By doing this, he gives worldwide notoriety to himself and his ideals of hatred," said Hubert, who at 13 escaped Germany on a transport to England just weeks before World War II erupted. "He chooses martyrdom to glorify his hatred similar to a suicide bomber." Authorities say von Brunn acted alone, but Hubert says he represents all those who share his views. "This empowers these people to think that this is how you get to be famous, gain notoriety, and they hope other people will mimic him -- and that's scary," he said. Eva Rich Blumberg, 85, of Rockville, Maryland, also worries that the shooting may have emboldened others to attack Jews and symbols of Jewish culture, she said. "I lost everyone in the Holocaust. This incident just shook me up so that I don't know what to say," she said. Anytime a group asks Blumberg to speak about the Holocaust, she obliges, she said, out of a sense of duty to educate people so that the atrocities perpetrated by Nazi Germany are never repeated. However, she said Thursday, the shooting at the museum leaves her wrestling with the decision on whether to deliver her speech this weekend. "I'm frightened. I don't know what to do," she said. "I couldn't sleep all night because things keep coming back." Fortunately, Spiegel was downstairs and didn't hear the shots, but that did not dampen her anger and disgust over the incident. Spiegel, who met her husband of more than 60 years, Samuel, at a slave labor camp in Auschwitz, teaches children to shun hate in hopes they will blossom into productive adults unfettered by ignorance and prejudices -- "just the opposite of what he is," she said, referring to the museum shooter. "We don't teach hate," she said firmly. "This guy, every time I think about it, it makes me sick that there are such people around." "It's an ultimate act of Holocaust denial and I and all Jews -- especially survivors -- feel violated all over again," he said. "To attack that symbol is striking at the very heart of what the museum is trying to do, what America stands for -- the fight against bigotry and hatred." Hubert and Blumberg both expressed concern that von Brunn was able to express his hateful views on Jews and minorities via the Internet. Neither is impressed with the freedom-of-speech defense. "Hitler's Germany, they had freedom of speech and look what happened," Blumberg said. "Freedom of speech has to be controlled." Added Hubert, "It's the uncontrolled Internet which provides the tools and means for this scourge to spread, and it's a very dangerous thing that's happening." While Hubert believes the United States should strengthen its laws to prevent these types of incidents from occurring again, he also concurs with Blumberg and Spiegel that the best way to counter bigotry is "by placing greater emphasis on prejudice and hatred for next generation," he said. "The lesson is we need to be vigilant and proactive in combating hatred," Hubert said.